I am a little bit too excited i guess. I only introduced my children.....back to introducing myself! 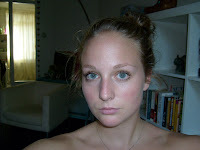 I am not really about putting my face on the internet, but i thought maybe it's nice to know the face behind this blog. So enjoy (;)), cause this might be the only time something like this happens. Recently i changed my hair..